My name is Aurelia Czarnecka. I was born in 1976 in a small town in south-west part of Poland. After my graduation from University in Poland obtaining a Master degree in Accounting, I moved to Scotland in UK where I live since the past 10 years. I am a mother of two wonderful kids. As I remember I always loved baking but I discovered my passion for cake decorating a few years ago, when I made my first cake for my daughter's 5th birthday. Although it was not great I fell in love with the art of cake decorating. At first I was making cakes for my family and friends just as a hobby but little by little it turned into a real passion and finally after gaining some experience and confidence in sugar art I decided to turned it to my work. 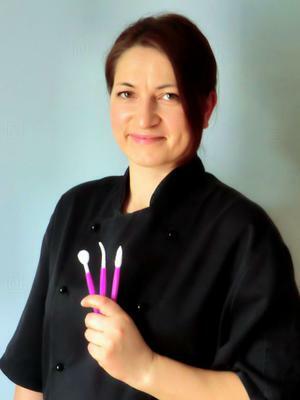 Currently I am an owner of Aurelia's Cake Studio, located in Stirling. I enjoy participating in several international collaborations as this gives me an opportunity to create new things and each piece is always a challenge. In 2017 I took part in Cake International Competition in Birmingham for the first time where I have won Bronze Medal in class Q -Tiered Celebration Cake. It was very exciting and stressful experience at the same time. 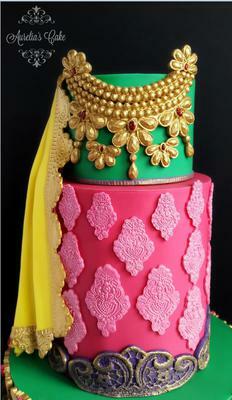 I am planning to compete in Cake International Birmingham this year again. My works have been featured in cake magazines such as Cake Masters, Cake Decoration and Sugarcraft, Cake Heaven, Cakes and Sugarcraft, Party Cakes & Bakes and Cakes Decor Gazette. My piece for Spectacular Pakistan Collaboration was inspired by the vibrant colours and intricate patterns, textures used in Pakistani fashion. 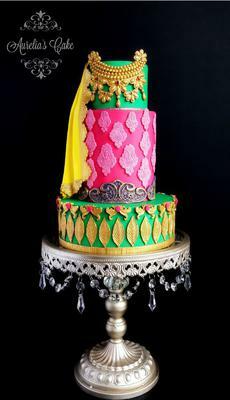 In that context I made a 3 tier wedding cake in some traditional Pakistani colours - gold, festival holly green, warm pink and lovely yellow, I adore the combination of these colours. The bottom and middle tier showcases fantastic patterns and embroidery you can find on Pakistani textiles, top tier is embellished with traditional jewellery worn by brides in Pakistan on a special occasions such as weddings.